A few October finds from the Presbyterian Church Men's Garage Sale just up the street plus a very few garage sales. The quieter season for thrifting has arrived. 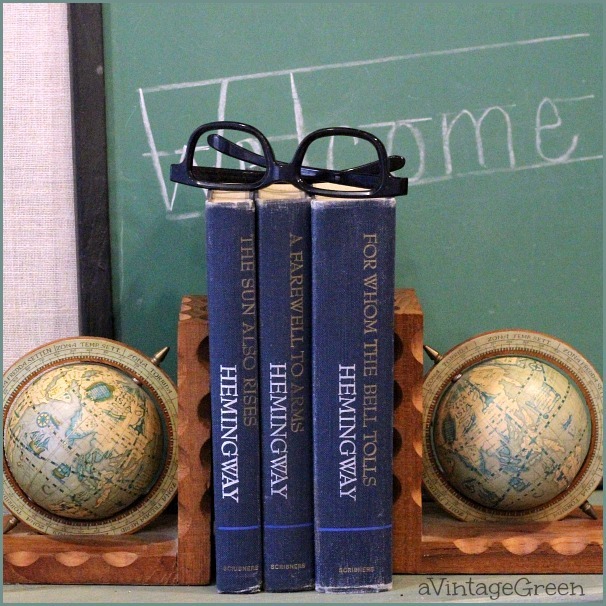 The Hemingway books and globe bookends made a pleasant literary vignette with the chalkboard and dark rimmed glasses (borrowed from DGS's costume collection). 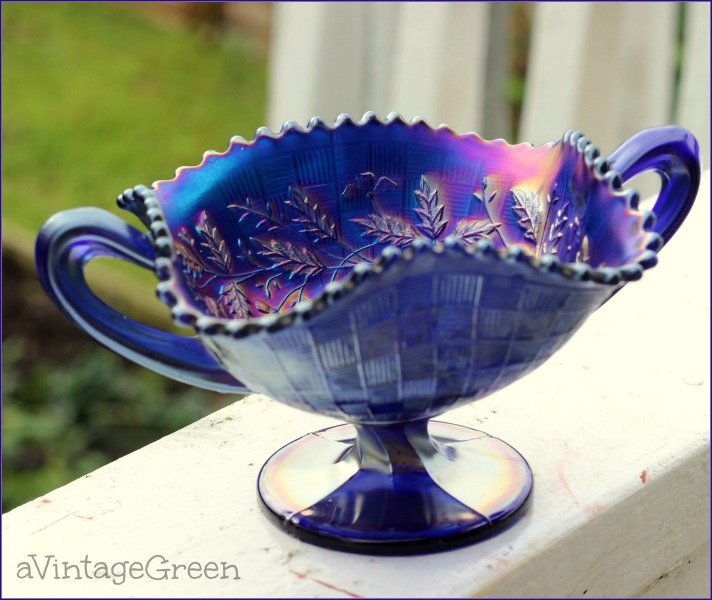 This beauty is Northwood glass, a 3 fruit patterned blue lustre footed and handled bon bon dish. Love the way the sunshine showed the colours. Since rain has been pretty steady and heavy all week I was very happy to see sunshine. Big storm coming through Tuesday. Federal Glass red dotted bowl, orange dotted bowl is unmarked, Hazel Atlas (thank you to Sir Thrift A Lot for identifying it), both bowls are cheerful, handy, medium sized. 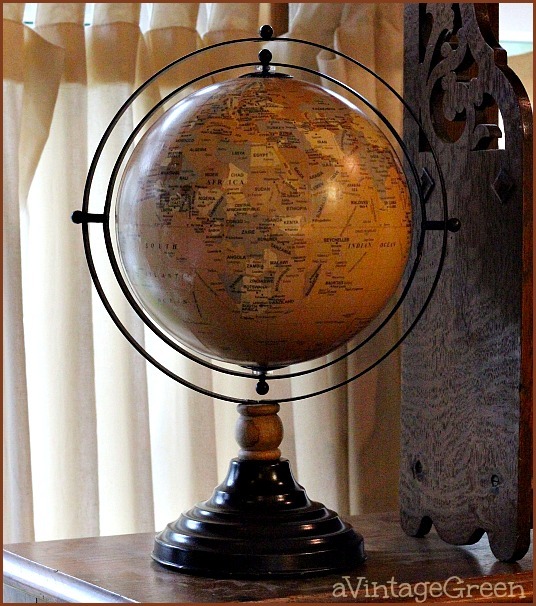 A classic globe, great for display. Grindley stoneware vintage mould, puppy with bow. 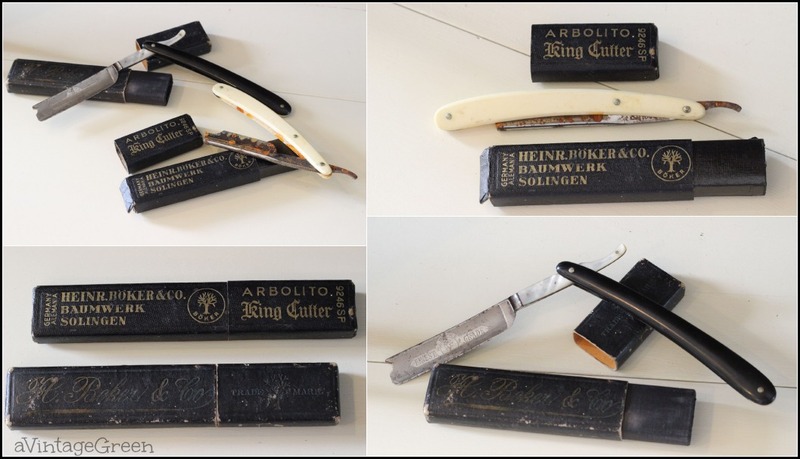 Bit of shaving history, straight razors in the original cases. Rusted blades, worn razors. This little overnight case needed a bit of TLC. The lid interior backing and mirror were missing when I found it. Small project. I used a piece of stiff cardstock, a piece of scrapbook paper that echoed the colour of the lining cloth and a mirror taken from a small framed mirror to make a replacement. First I cut/glued the paper to the cardstock (let it dry overnight under heavy books). Glued (used Carpenters Glue) the new backing to the suitcase inner lid and again weighted it down and gave it lots of time to dry. Third step was adding the mirror (again glued, weighted and several drying days). Secure, pretty again and ready for use. Lots of wonderful finds, Joy! The bon bon dish is such a beautiful color! Love all your finds, the case especially and you did a great job touching it up. Love all your treasured finds, especially that blue dish..really pretty! Have a great week. What super things you've acquired! I especially like those Hemingway books. Treasure for sure! Thanks for being so faithful to Blue Monday, and for sharing your blue. What awesome treasures. 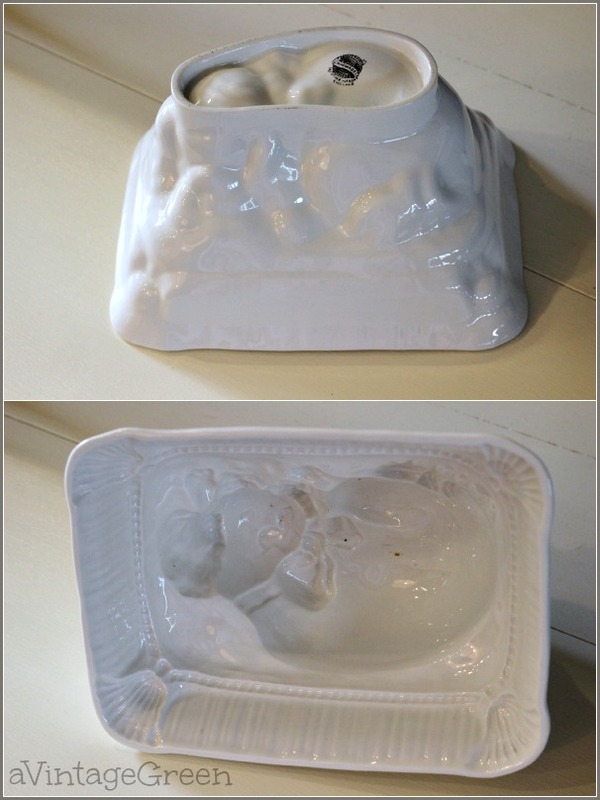 I love the ironstone molds. That blue footed bowl is just about the most beautiful thing! Love all the globes, and the bonbon dish, gasp, so pretty! Thanks so much for linking up at the Make it Monday Party! Hope to see you again next week. Some great treasures found. Glad I don't have to shave my legs with a straight razor - yikes! I remember my grandfather shaving with a straight razor. Great way to makeover a train case - love the paper lining. Your outing that day really paid off. Those are all great finds. Great finds. Good reading to keep you occupied during the winter. I come to you by way of Mosaic Monday. Hope to see you again to see you treasures. 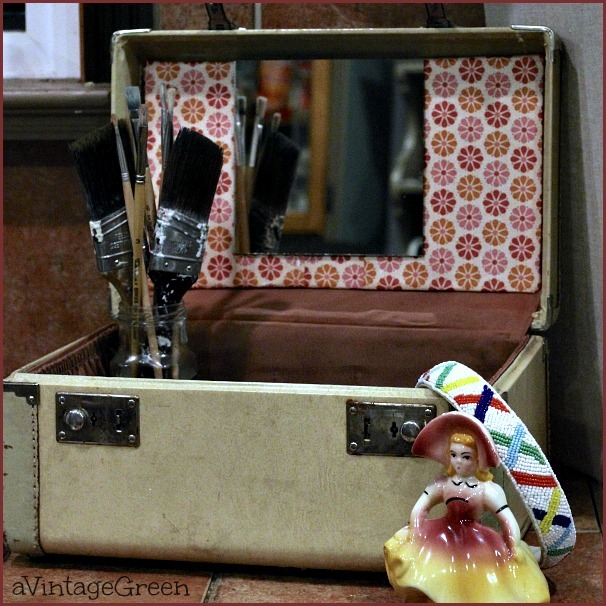 My daughter and I haunt the junk and thrift stores where find our own little treasures. I look for dollhouse furniture and Barbie Mermaids, and Lenox china. Oh how I wish we had one of those at home. Your finds are incredible. The little suitcase is my favorite piece. Can I go next time? Love the dots! The unmarked is Hazel Atlas. I just found the brown one last week. I need the turquoise one. Some very nice finds. Love the book vignette. Joy, you found some great treasures! 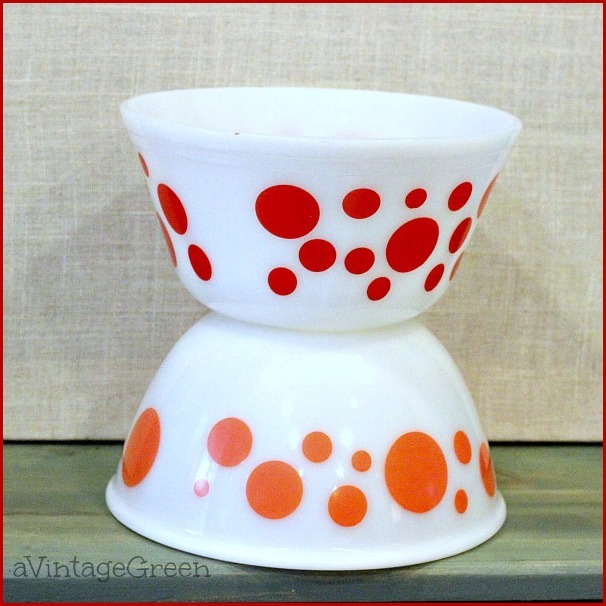 Those Fire King Dotty Bowls have been on my 'hope to find' list for quite some time. Thanks for sharing with SYC.